Island School students present research to symposium attendants. (November 30, 2013- Eleuthera, Bahamas) Cape Eleuthera Institute (CEI) and The Island School hosted their bi-annual Research Symposium. Island School fall 2013 semester students shared their research through project presentations and poster sessions. “The most important thing we do is communicate our research to the public,” said Aaron Shultz, Director of CEI, in his opening remarks. 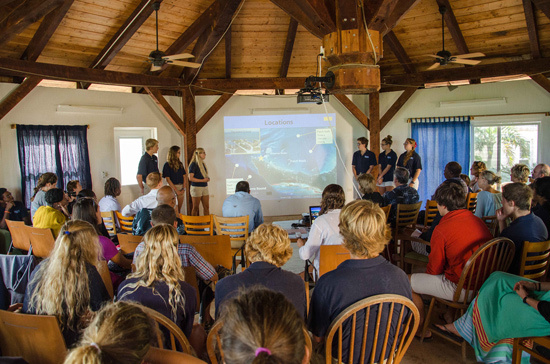 The event brought together regional stakeholders in marine conservation including representatives of The Bahamas Environment, Science & Technology (BEST) Commission, the Ocean Research and Conservation Association (ORCA), Save the Bays, the Bahamas National Trust, students from the Deep Creek Middle School’s community resource center, local fisherman, other public figures, and neighbors. Scotiabank was represented by Bridgette Bowe-Newman, Manager of the Rock Sound branch, who presented a $5,000 cheque to the Deep Creek Middle School. “Scotiabank, in alignment with its Young Futures Program, is honored and privileged to award this financial support,” said Bowe-Newman. The financial award brings Scotiabank in as a corporate sponsor of the DCMS. 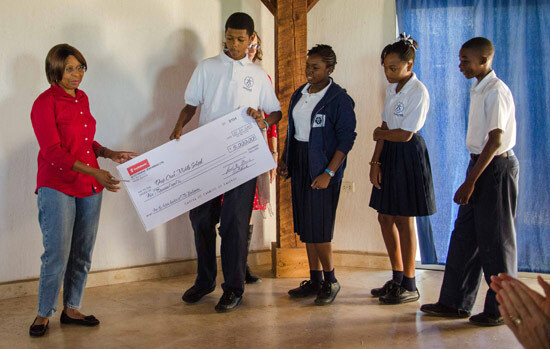 The cheque was accepted by DCMS students, CFO Christian Henry, and Dr. Joanna Paul, Director of Education and Advancement for the Cape Eleuthera Island School. Bridgette Bowe-Newman of Scotiabank presents a $5,000 cheque to the Deep Creek Middle School accepted by DCMS students, CFO Christian Henry, and Dr. Joanna Paul, Director of Education and Advancement for the Cape Eleuthera Island School. Island School Student presentations were followed by Dr. Rhianna Neely who shared her own doctoral research on climate change risk perceptions by Bahamians. Neely opened her presentation by celebrating the advanced scientific work being done by young people at The Island School. Widder shared stories and results coming out of decades of underwater research and exploration. She shared images from the Medusa, a pioneering mechanism of deep water imaging, which recently captured famous footage of the legendary Giant Squid, and captivated the audience with a call to action to confront global challenges of marine conservation. For more information about The Island School or ongoing research programs at the Cape Eleuthera Institute visit ceibahamas.org or islandschool.org.